The illustrated DMT Knife Sharpener is the Coarse Benchstone Knife Sharpener that features the DMT trademark distinctive hole break up pattern. They utilize Monocrystalline diamonds that are securely bonded in nickel, and then are electroplated onto the perforated stainless steel plate; all of which is supported by a lightweight fiberglass reinforced polycarbonate base. This makes for an efficient lightweight knife sharpener. Use the Coarse 325 mesh, 45 micron diamond sharpener to quickly sharpen a neglected edge. 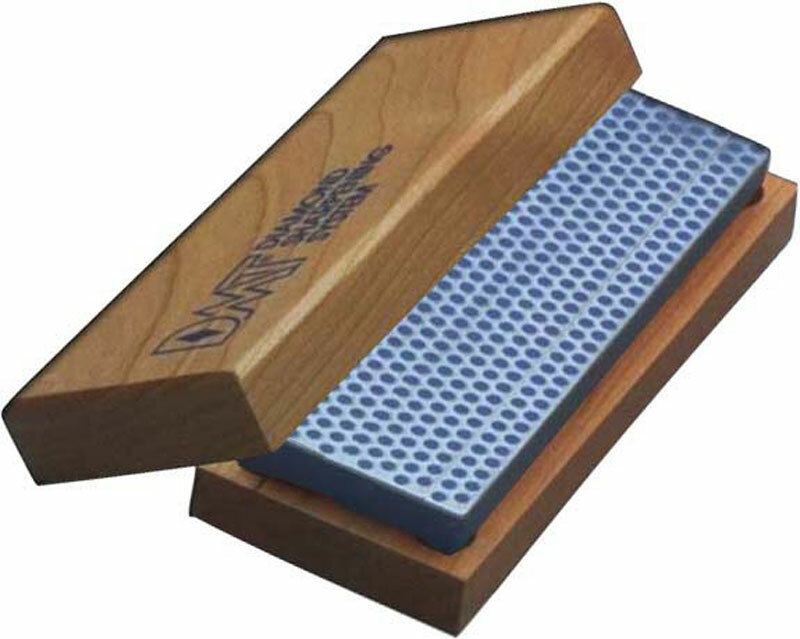 The DMT Benchstone Knife Sharpener with Coarse grit measures 6" long by 2" wide. A wood storage case with non skid feet that can be easily bench mounted is included with this DMT Knife Sharpener. Unlike a conventional knife sharpener, a DMT Sharpener stays perfectly flat for precise sharpening, won't develop grooves or hollows, and never needs dressing. They work perfectly well dry, but water may be used as a lubricant. Oil is not recommended.